Figment Fun at G.A.P. Travel: Muster Up! Ship Safety Taken Seriously or Going Overboard? Mike Driscoll, publisher of the Cruise Week newsletter, said that the husband (90) attended the drill, but his wife (84) did not attend, claiming she did not feel well and had done it before. The couple was debarked from the ship, with no clear indication of whether a refund would be issued for the portion of the cruise they did not complete. Seabourn released a statement reiterating the seriousness of the drill, saying that a passenger too ill to attend could be scheduled for a "make-up drill when their health permits". While I do feel some sympathy for any people, especially a couple of advanced age, left on a pier at Lisbon, muster drills exist for a reason. It is my belief that those who feel that they are veteran cruisers and do not need to attend the muster drills are not only putting themselves at increased risk, but putting others lives at risk as well. In an emergency situation, every second can count. The muster drill is a carefully constructed safety seminar in surviving a problem at sea. 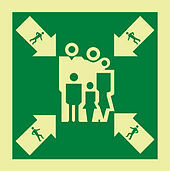 Passengers see the quickest way to evacuate, see where their evacuation station is, and gain familiarity with the process. People who don't know where to go in an emergency or don't respond slow down the process for everyone. Guests reporting to the wrong station could prevent entire boats from being launched properly. Crew members searching for guests in cabins could put their own lives at risk. It doesn't matter if you have been on one cruise or fifty, every drill is important. It can be debated that perhaps the penalty was too harsh for the violation, but it is unclear how else to motivate reticent passengers to attend. Fines could possibly be levied for non-compliance, but that does not solve the underlying problem of travelers not properly briefed in procedure. Debarkation is serious deterrent, and possibly the only one that hits travelers where it hurts. Refunds are another matter entirely. Should passengers be given back money for being booted off a sailing? It certainly would not be a full refund, as that is a cabin that the cruise line could have made more money on if the booked passengers had sailed. A partial refund or a small stipend to help offset the cost of the airline ticket it is going to take to get you back to your home port might be a nice gesture, but it is unclear if it would really be deserved. Have an opinion? Leave a comment, and share our article if you find it interesting!